SKU: W319 18 28 38 Angle. Categories: Ashley, Entertainment Centers. Tag: W319. Description: The richly detailed mission design of the “Cross Island” TV stand captures the beauty of rich country style with a versatility that enhances any living room area. The medium brown oak stained finish is beautifully accented by the mortise through ornamentation to create the rustic beauty of finely crafted mission styled furniture. With framed doors, featuring mission styled overlay slats, that open to ample storage areas and cast hardware finished in an aged bronze color, this TV stand perfectly enhances any living environment. 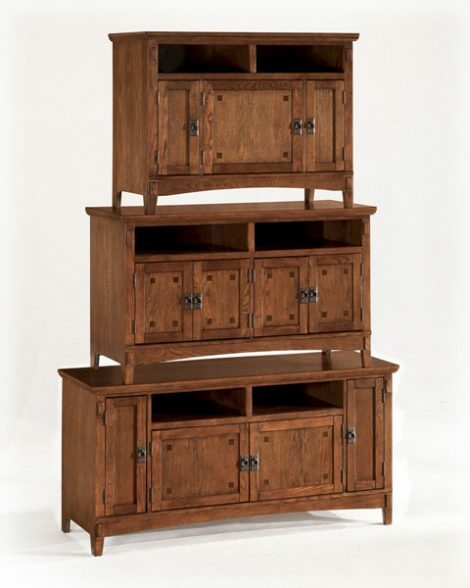 Accent your home’s beauty with the rustic style of the “Cross Island” TV stand. Series Features: Made with select oak veneers and hardwood solids. Mission styled cast hardware in an aged bronze color finish. Framed doors have mission styled overlay slats. TV stand features adjustable shelf. Vented media storage. Cord management throughout.